Provided estimate for metal roof, siding & doors. Installed Atlas Pinnacle shingles in Bowdon. Windows of our Radiance Series are sure to please. They feature Fusion Welded Corners, Die Cast Locks, Flush Mount Tilt Latches, AAMA Certified Double Night Locks, Multiple Rows of Weather stripping, Constant Force Balance System, Integral Lift Rails, Compression Bulb Seal, Multi-Chambered Vinyl Frame, Beveled Exterior Frame, Full Width Overlap Interlock, Tilt In, Lift Out Sashes, Double Paned Insulated Glass, Intercept Spacer System, Extruded Aluminum Screen Frame, and a Sloped Sill. They also come as slider windows, casing and awning windows, bay and bow windows, and patio windows. However, our Radiance Series is just one of our window installation specialties. Siding installation is one of Ben Hill’s many specialties! Replacing your siding is a very effective way of updating the look of your home, but it’s not just all about looks. New siding is essential to insulation and separating the elements of the outside from the inside. If your goal is to update your home or update your community with quality siding, Ben Hill Renovations is your go-to. Roofs wear out. They get worn and beaten, battered and dented. They get abused and bruised and suffer all sorts of ailments from the elements that be. 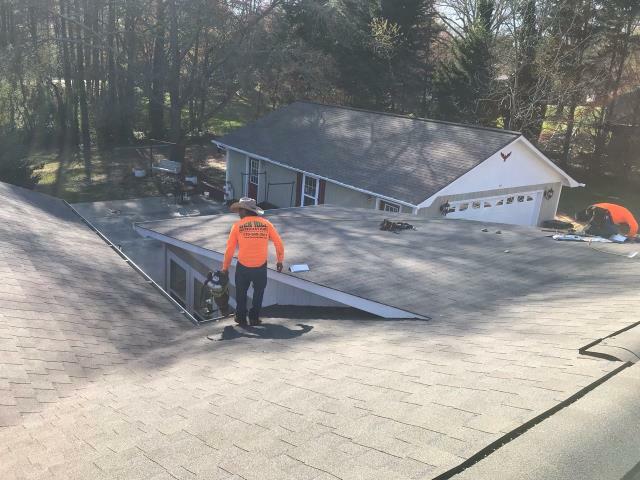 Hail, snow, and water may come, but roofs take it for the team every time. They cover your family. They cover your church. They cover your restaurants, your businesses, and all the venues you explore. But in the end, it is these same roofs that must embrace each storm and endure the whims of nature. It is these same roofs that often end up with the short end of the stick, and literally sometimes branches and sticks. So whatever it may be in your case, show your roof some love when it’s worn out and call Ben Hill Renovations today! Decks can be a great asset in homeownership. Some people have decks that can fit a whole party of people. Some people have decks so small it makes for just a nice place for one or two people to sit and talk or bask in the moment and take in the great outdoors. Some like it small. Some like it big. Some are one story. Some are multi-story. Some have a traditional layout. Some have a creative layout. Whatever you envision, come see what Ben Hill Renovations can do for you. Exterior Renovations of any kind in Bowdon is our specialty!